Ever Oasis welcomes you to the desert world of Vistrahda, a land that, long ago, was nothing more than desolate sand and harsh sun. Brave but gentle creatures known as Seedlings called it home, beings that are born with a tiny seed buried deep within their hearts. Seeds carried by Children of the Great Tree can be harvested when blessed with water, soon seeing lush oases spread greenery across the otherwise treacherous desert. However, those that call the desert home live in constant fear of Chaos, the oases provided safety and sustenance to weary travellers while protecting them from the unpredictable dark force. But, one day, a powerful beast appeared that overpowered them, raining down destruction on anything that lay in its path. It took a brave Seedling blessed with the seed of a Great Tree to drive the Chaos back once again, allying with a water spirit to create an oasis enveloped in a radiant rainbow’s light. And, while Vistrahda has lived in relative peace since then, the malevolent Chaos has returned with even greater strength. That’s where we start in Ever Oasis, an enchanting new IP born in the mind of Mana series creator Koichi Ishii and Grezzo, a developer many will already be familiar with thanks to their work on The Legend of Zelda: Ocarina of Time 3D and The Legend of Zelda: Majora’s Mask 3D. After choosing to play as a young Seedling boy or girl – named Tethu or Tethi respectively – customisation options will let you personalise your character before setting out. As an oasis chief in training, the adventure begins with your brother mentoring you through the basics – fear not, as this doesn’t last long. That sees you learn to use your wind magic to sweep up sand that has blustered into the garden, the seemingly innocent enough task soon becoming all the more menacing when Chaos plants unexpectedly sprout in the area. Moving on to interact with residents, you learn that their peace, joy and calm sustains the rainbow that radiates above the oasis and, in turn, protects everyone from Chaos. Without their happiness, there would be no protection. But, after your brother’s explanation, the skies turn purple and a Chaos beast soars overhead. Rushing to check that the oasis inhabitants are safe, your brother battles the marauding enemy only to put himself in harm’s way to protect you. Fearing the worst, he uses his wind magic to help you escape – placing all hope in you to create another oasis that will flourish more than his own. Whether through destiny or fate that results in you meeting Esna, the last water spirit in the desert. As a Child of the Great Tree, Esna, perhaps through her own boredom, realises that she can help create your own oasis, hoping that you can work together to build a bustling hub that will keep desert dwellers safe from Chaos. Bound to her spring, Esna communicates with you on your travels thanks to Khepri, a beetle that carries a water orb infused with her power. The oasis immediately becomes your shared passion project, Grezzo cleverly implementing a three-pronged gameplay hook that will see you exploring your surroundings to discover dungeons, defeating Chaos-infused wildlife to collect materials and level up your party, and building your Oasis to attract more travellers to expand it. It isn’t long before you are thrust into this, your first potential resident wandering into your oasis and asking for your help to collect materials to let her build a Bloom Booth. The request is an easy one, but, as you progress further into the game, they will become increasingly challenging and residents may seek assistance with more than one task. Once completed, they will decide to call your oasis home and, with your resources, can build Bloom Booths along the Main Road to reward you with a source of income. It is the Noot that splash their cash, adorable creatures whose appearance combines owls and penguins that waddle into your oasis each morning to see what’s available to purchase. The more Bloom Booths that you build, the more opportunity you have to make them part with their money. That expansion will steadily come with time, but you will need to make sure that the Booths are restocked – eventually made all the easier when Jamileh discovers your oasis and will help you quickly distribute resources across them all. There’s also a Garden to plant seeds to grow ingredients, and the accumulated materials that you gather can be used to craft new weapons, accessories and armour to strengthen your party’s combat prowess at the Synthesis Tree. As can be expected, upgrading these at regular intervals will be key to your survival in battle. Keeping the residents at your oasis happy will also boost your HP when exploring outside its confines. 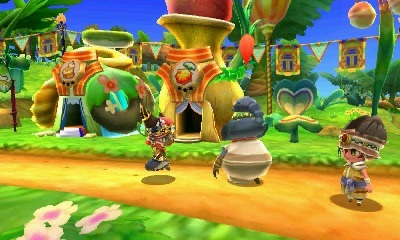 Residents will share rumours that they have heard about other travellers near the oasis, and this is where the more action-orientated approach in Ever Oasis comes into view. These rumours largely act as side quests, encouraging you to explore your surroundings to meet travellers that you can invite to live in the oasis. While you can certainly adventure outside the oasis on your own, safety in numbers will soon become paramount as you encounter increasingly tougher enemies. The opening hour will lead you to meet residents that you can create a three-strong party with, and, over time, you will build a roster that you can freely switch between. There are multiple tribes that you will encounter on your travels, whether that be Seedlings, the lizard-like Drauk Tribe, the one-eyed ogres from the Serkah Tribe, or the nature-worshipping Lagora Tribe. Each has their own abilities that will help you in the puzzle-ridden caverns and dungeons that you will delve into, as well as weapon strengths that can be used to exploit enemy weaknesses for bonus damage. That can see characters hunch into balls to roll through passageways, use spears to activate switches, smash boulders that block your path, or use their wands on crystals to light a room. Seeing as you are given multiple warp points and can place your own Aqua Gate at any location, it’s easy to beam back to the oasis to change your party to react to any puzzles that you come across. There’s certainly some trudging through areas to hunt for enemies to harvest materials from, but Grezzo has worked hard to make sure that players don’t feel irritated by journeying back and forth. Combat instances play out in real-time, the enemies that you face being in clear view to let you either directly engage or sneakily skirt around them. More dangerous enemies emerge at night, so it will become important for you to keep an eye on the clock as the day progresses. Early on you can use light and heavy attacks as well as dodging, and, as your characters level up by defeating their foes, you will unlock potent combo attacks. These instances are made less frustrating thanks to the fact that you can automatically lock on to the nearest enemy by pressing the L Button, a camera trick that Grezzo has been allowed to pluck from The Legend of Zelda series. 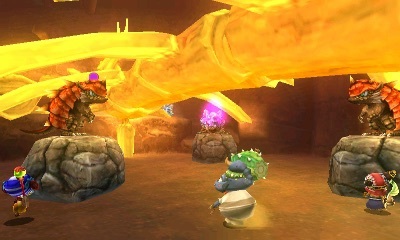 This certainly becomes ever more useful in the boss battles that you will have to deal with deep within each dungeon. With your oasis to care for and multiple dungeons to explore, there’s surprisingly lots to do, so I can be thankful that it is easy to keep track of what’s left to keep you busy thanks to the To-Do List, where story missions and general requests from residents are recorded. This can not only point you in the right direction on the map but will let you look back at the chat log if you’re in need of a few pointers. It’s worth mentioning how brilliant the character designs are, coupled with an art style that, aside from sandy dunes in most directions, amounts to a visually wonderful addition to the Nintendo 3DS library. Although, it’s a shame that the soundtrack won’t linger in your memory for as long. 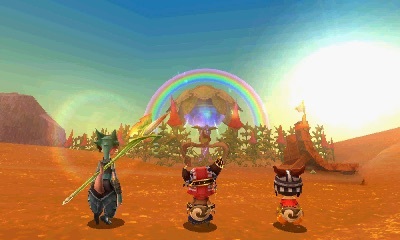 Ever Oasis presents a wonderfully captivating tale that, despite the sizzling desert heat, enchants like no other. Magical, entrancing and beautifully presented, it’s playful looks may scream with a childlike appeal but, make no mistake, this is an RPG with tremendous depth that all ages will enjoy exploring.